Google recently announced a new feature for Google Docs that I believe teachers will find very helpful when providing feedback. In addition to offering suggestions through Comments in student documents, anyone with Comment access or greater can also add inline suggested edits. To view the document without suggested edits, select Viewing. Suggestions are hidden from view allowing creators to view and publish a clean version of their work. The option can be turned on by selected the new Editing button that appears on the far-right of the tool bar. Once enabled, anything typed will be considered a suggestion, and therefore made permanent or removed with one click by the document owner. Suggested changes are visually different: text color matches the user's cursor and color band below the avatar. A comment box appears at the right highlighting the edit location while also allowing a discussion. This new feature has also solved one of my smaller gripes with the comment feature. While not something I require for all projects, occasionally I would like to permanently document the suggestions I offer students. 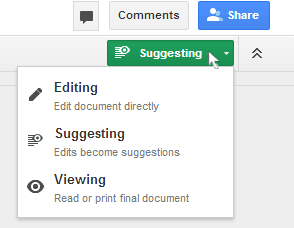 When in Suggesting mode, the suggested edits do appear when the document is printed. Unfortunately the sidebar discussion is still not included. Connect with a colleague to experiment with this new feature. Or, visit this document and try it out (no login required, Comment permissions set). GTSD staff are invited to contact Mrs. 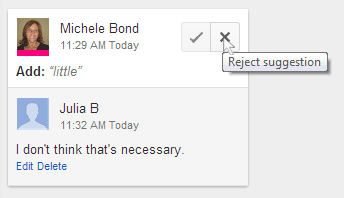 Bond to discuss how to use this and other Google Apps tools with students.